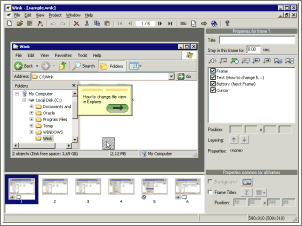 Wink is a Tutorial and Presentation creation software, primarily aimed at creating tutorials on how to use software (like a tutor for MS-Word/Excel etc). Using Wink you can capture screenshots, add explanations boxes, buttons, titles etc and generate a highly effective tutorial for your users. It can Capture screenshots automatically as you use your PC, based on mouse and keyboard input (great time saver and generates professional captures). * Cross-Platform: Available for all flavours of Windows and various versions of Linux (x86 only). * Audio: Record voice as you create the tutorial for explaining better. * Input formats: Capture screenshots from your PC, or use images in BMP/JPG/PNG/TIFF/GIF formats. * Output formats: Macromedia Flash, Standalone EXE, PDF, PostScript, HTML or any of the above image formats. Use Flash/html for the web, EXE for distributing to PC users and PDF for printable manuals. * Multilingual support: Works in English, French, German, Italian, Danish, Spanish, Serbian, Japanese, Brazilian Portuguese and Simplified/Traditional Chinese. * Smart Capture Tools: Capture screenshots automatically as you use your PC, based on mouse and keyboard input (great time saver and generates professional captures). * Performance/Quality: Creates highly compressed Flash presentations ideal for using on the web. Qweas is providing links to Wink 2.0.1060 as a courtesy, and makes no representations regarding Wink or any other applications or any information related thereto. Any questions, complaints or claims regarding this application Wink 2.0.1060 must be directed to the appropriate software vendor. You may click the publisher link of Wink on the top of this page to get more details about the vendor.